One of the main goals of Swachh Bharat Abhiyan is waste management. 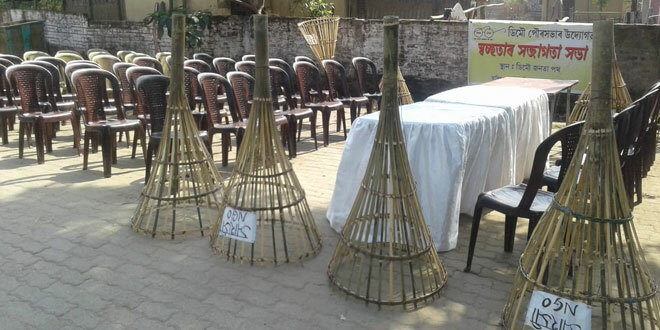 Keeping that in mind Assam has decided to give up on the practice of using plastic dustbins and instead switch to a more eco-friendly alternative and that is why we have decided to install bamboo bins. Plastic is a non-biodegradable thing, it ends up staying on the planet for some thousands of years and if we continue to use plastic like this then our planet will drown under the plastic waste mess. With this one practice, we want to motivate people about ‘reuse, recycle’, two of waste management’s most important terms and make them understand why they also should switch to eco-friendly alternatives to plastic. This is not the first time, Assam has taken a lead in plastic waste management, last year, the state decided to construct roads using plastic waste, thereby reducing the load from its landfills. The first-of-its-kind project for the state was launched on the Kahilipara-Dakhingaon Don Bosco Road. According to the Beat Plastic Pollution study that was released last year on World Environment Day, Assam generates 2.99 lakh kilogram of plastic waste every day. Of this volume, 37,000kg of waste is generated every day in Guwahati alone. To change this grim reality of plastic waste generation, the state has been aggressively taking steps. Recently, Assam Chief Minister Sarbananda Sonowal has also stated the state’s goal to make Assam plastic-free, he urged people to help them beat plastic pollution, and transform Assam. I love to see something environment friendly. But is this just show stunt, is it really effective.